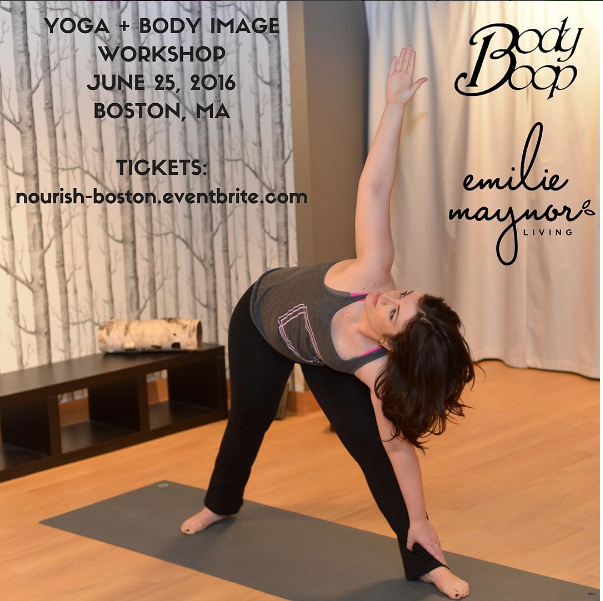 Body Boop & Emilie Maynor Living are proud to present another installment of NOURISH: A Body Image Conversation at the Multi-Service Eating Disorders Association (MEDA) near Boston, MA! Our half-day workshops allow attendees to have honest, valuable conversations about where their perceptions of body image come from. As a group, we work on tools for healing and acceptance, and hopefully provide you with a feeling of liberation that you can ride all week long! 2:15pm to 2:45pm – Presentation by Rachel Barbanel-Fried, Psy.D. 10% of profits go to support the Multi-Service Eating Disorders Association (MEDA), an organization that works to prevent the continuing spread of eating disorders through educational awareness and early detection. MEDA serves as a support network and resource for clients, loved ones, clinicians, educators, and the general public. Learn more here. I have an eating disorder history – should I be worried about triggers? Body Boop events have a strict NO NUMBERS policy. This means attendees should not discuss weights, calories, etc. out of respect for those who have struggled or who are currently struggling with eating disorder(s). There will also be no discussion of tips and tricks or crash/fad diets. A balanced snack will be provided for everyone, and will allow those on meal plans to stick to their recommended exchanges. It is recommended that anyone who has different nutritional requirements or feels hesitant about eating in front of others bring his/her own meal or eat prior to arrival. What if I’m new to yoga? The structure of our yoga portion is designed for all experience and fitness levels. No prior experience is necessary. We recommend bringing your own mat, but if you do not own a mat, we will provide mats first come first serve. That’s totally up to you! It’s Saturday, so get comfy, especially if you plan on participating in yoga. We want to foster an environment where everyone is his/her most comfortable. We encourage people to sit in chairs, on their mats, or stand during presentations – however you can best learn and digest information. Our recommendation is yoga pants, a t-shirt or tank and tennis shoes or sandals. Body Boop tanks and t-shirts will be available for purchase, too. How do I get to MEDA? MEDA is located in a renovated stone church building on the corner of Newtonville Ave and Walnut St. in Newtonville. The entrance to the building is on 449 Newtonville Ave.
Our workshop will be held in the large room! Take Rte. 95/Rte. 128 North or South to I-90 East (Mass Pike). Follow directions from Points West. Take Rte. 93 North or South to I-90 West (Mass Pike). Follow directions from Points East. Please visit mbta.com for more information or use Google Maps. *Please do not park in lot on Newtonville Avenue or you may get towed.